Whether you have a laptop, computer, tablet or smartphone, Currys PC World has a wide selection of antivirus software to keep you safe online. Our internet security software works across a range of different devices, making it a one-stop shop for all your antivirus needs. Connecting to the internet can put your device at risk. Without the right security in place, spyware, malware and spam can infiltrate your computer and play havoc with your device. Antivirus software acts as a robust security mechanism against these online threats, protecting you from fraudsters and hackers looking to steal your personal information. Install internet security software on your computer and you’ll be able to surf, shop or bank online, in full confidence your information is safe and secure. It also gives you and your family privacy when using your device online. 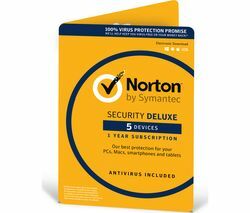 With so much of our personal and business lives now stored on our computer, it’s never been more essential to have top notch anti-virus software in place. If you’re looking for internet security for your office, we have a great selection of business software that’ll keep your files and data safe. With our Norton antivirus software you get protection on up to 10 devices, making it a great-value option for any business. Our McAfee antivirus software is also ideal if you want to make your digital life more secure. 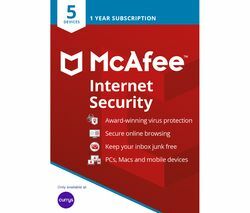 McAfee provides total protection and comes with anti-phishing software that prevents your sensitive information from being stolen. Don’t run the risk of fraudsters and hackers gaining accessing to your device. Get protection with Currys PC World great range of antivirus software.